“This tastes even better than fries,” I thought, as I bit into the crisp red-brown morsels that were soft and a tad chewy inside. They were dusted with salt and chilli powder, and the crackle, softness, spice and salt present in one hearty, umami-filled bite meant that I couldn’t stop popping them in my mouth. This was my first taste of the vegetable called eddoe or arbi as it is commonly known in India. When I went shopping for them, I could have entirely missed the nondescript brown-skinned, furry, yam-like vegetable that lay in heaps in forgotten bins in the Indian grocery store. Back home, they sat on my countertop like a pile of small hedgehogs. First, I boiled the whole arbi. Either a whistle or two in the pressure cooker or a good boil on the stove in a large saucepan filled with water until a knife slid smoothly into the vegetable. Next, I peeled off the outer skin and chopped up the somewhat slimy white flesh into small pieces. The pieces went into a little hot oil in a single layer in a large pan on the stove. The trick here is to let them cook on medium heat for a few minutes without stirring such that a golden crust develops. If I turn too quickly then the arbi pieces will stick to the pan. I discovered this wisdom on an episode of my new favorite show “To Spain with Love” that’s hosted by Annie Sibonney on the Cooking Channel. The chef who is deftly demonstrating how to grill fish on a flattop tells Annie to let the fish grill for a few minutes before turning otherwise it will stick. Simple advice, but very effective. 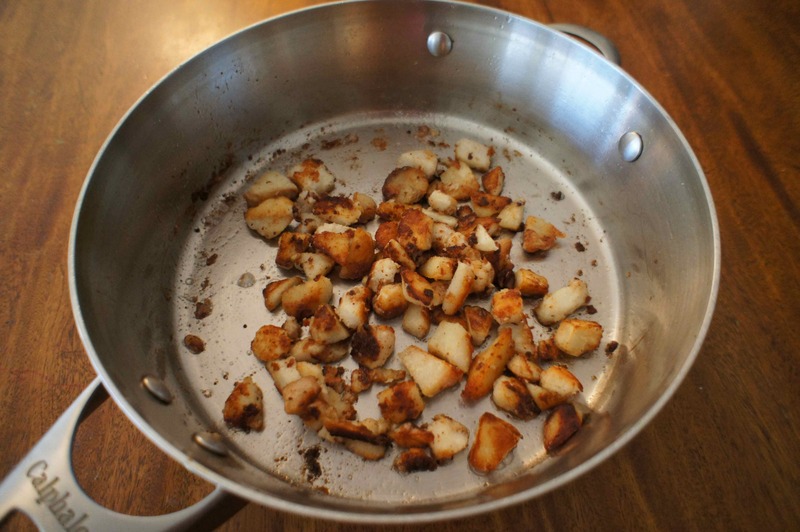 I’ve found that this technique works with all my vegetables – including green bananas, potatoes, eggplant, and it does away with the need for non-stick teflon pans. I can use cast-iron and stainless steel pans to achieve the same results, and in fact the starchy vegetables brown more crisply in these pans. For the single layer, work in batches if needed. Note: it’s helpful to heat the empty pan first and then add the oil. This makes the pan even more non-sticky. However, teflon pans should always be heated with a little oil or butter. Then, flipped over with a sharp edged spatula to scrape off any crusted bits and let the other side brown..and so on. Salt and chilli powder sprinkled at the end, and served hot with basmati rice, boiled toor dal, ghee and tart, spicy maagai (peeled mango) pickle. Or enjoyed as is. My dadi used to make arbi fry very often..in Sindhi, we call it ‘kachalu’… A slightly different recipe she used was that once the ‘kachalu’ is par boiled…. Peel off the outer skin, flatten it between your palms.. The inside is always a little hard allowing for a perfect press without crushing the gooey vegetable…. And slow cooking it in oil till it’s crispy on the outside… Same seasoning.. Add a little amchur if you like….. So nice to hear about kachalu – really making my mouth water! Thank you for reading :-). Thanks for the cooking techniques. I am ashamed to admit I have not yet mastered the art of frying fish filets. I was quite envious to see your no nonstick pan’s photo and quite delighted that you shared your secret! Fish fillet sounds delicious! Alright, when am I coming over? 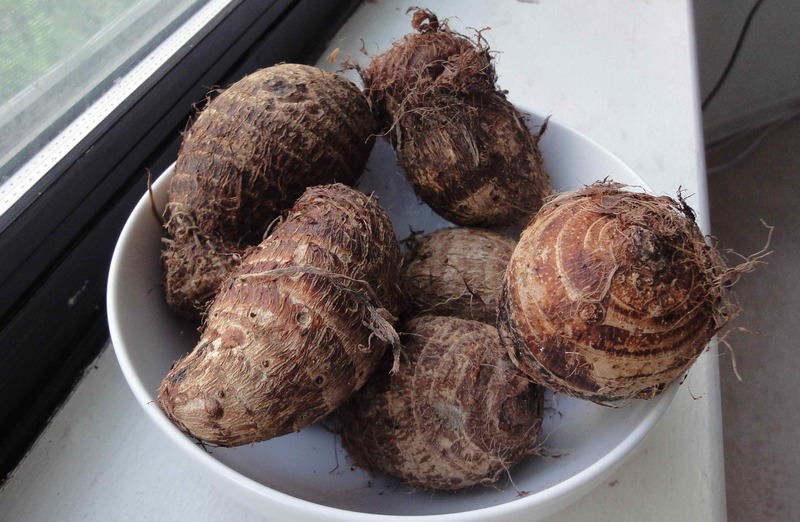 Keep the boiled and peeled arbi in the refrigerator for half an hour and then fry them. It is superbly fried with very less oil.